Welcome to TBT... on Friday this month. 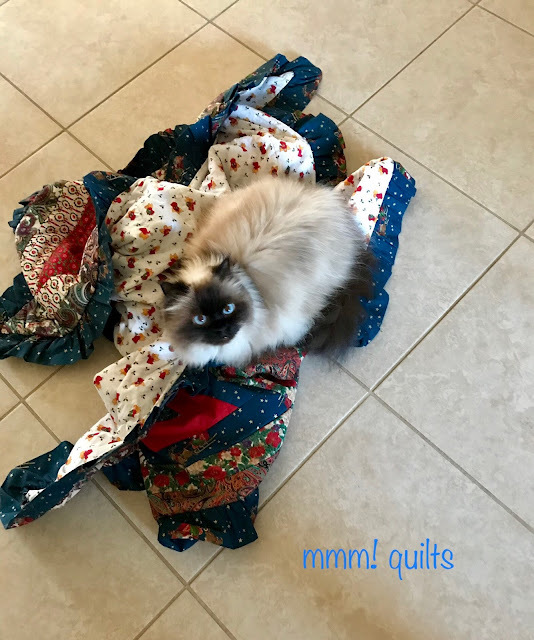 Last month it was the second Thursday because of just getting it up and running again, and this month because of the New Quilt Bloggers Blog Hop that opened for registration yesterday. Here's to TBT on March 1! I am somewhat limited for pre-blogging quilts here in Florida, limited in number, and limited because I've already done a couple TBT posts on two of them, Indianapolis and Frostbite. 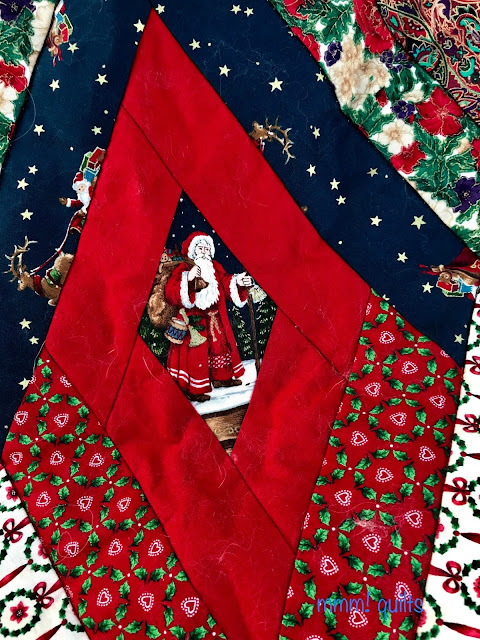 This tree skirt is not just pre-blogging, it's pre-quilting life! It was the first time I used a rotary cutter and ruler. All that said, I do love this tree skirt, as do the cats we have had since the first Christmas it was under our tree. There is rather a lot of cat hair on it to prove my point. As I was laying it out to photograph for this post, I started to pick some of it off and then thought na, it's part of why I do love it. True to form, and true to the love my cats have had, and Bella continues to have for this tree skirt! We were encouraged to find a print that would work for the centre of each diamond. I wanted a solid frame around each of the focus diamonds. Another favourite print in those I bought is the interesting blue you see a glimpse of there, not a midnight, not a navy blue, kind of a deep aquamarine or teal blue, with those gold stars and magical Santa in his sleigh racing across the night sky. I loved that print so much that I made the ruffle with it. You can see the backing here, a sweet angel no-so-great-quality fabric. It has held up very well. Oh that ruffle... yards and yards and yards. 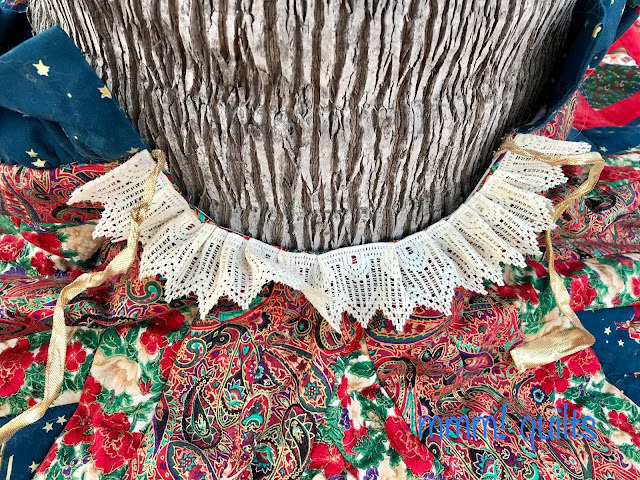 I remember Jenny taking pictures of us gathering that ruffle, pinning and pinning, pulling the threads some more, evening out the gathers and then finally carefully stitching it to the right side of the tree skirt. It took us hours and we burned the midnight oil. This may have been one of those times when it was going on 10 pm and I was about to drive the couple miles home and she said, "Why don't you just sleep over? Then we can keep working..." and of course our girls, then between the ages of 5-9 (she had two as did I) were ALL over that suggestion! We had some wonderful times, she and I, and our four girls. I remember being perplexed as to what to do at the top. Again the instruction left a little to be desired. In retrospect, I believe it was an inexperienced instructor, and an infant store, not a quilting store as of yet, that all were in play here. But it's all good, as look what I ended up with, and have used it every year but two since! So here's what I did at the top, which was where you turned it right side out. I stitched this pretty lace, good quality(!) around the top opening. It's left over from sweet little dresses I'd made my girls. I then sewed the lamé ribbon at each end to tie the skirt around the tree trunk. Just look at those rich gold glittery fabrics! Those are of excellent quality, also bought at Fabricland; I've used them in a few projects. We used 100% poofy polyester batting that was stitched between the layers (a turned pillowcase technique), and then once the skirt was right side out, I quilted between the second and third round of the diamond. It has stayed in place extremely well! Then again, outside of cats and presents on it for about a month or so each year, it doesn't get a lot of use. That's looking up from beneath the tree I wrapped it around! 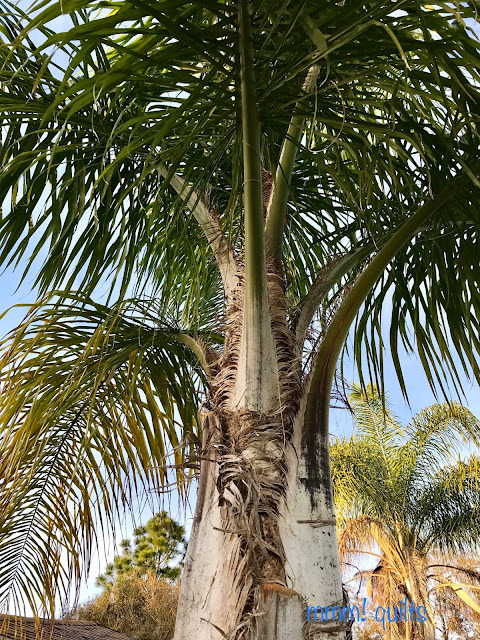 I never tire of palm trees. Funny, all those years ago when I made it, little did I ever imagine the tree skirt would 'live' in Florida from 2007 on, when we started spending all our Christmases down here! 1. Yesterday was the opening for registration for the 2018 New Quilt Bloggers Blog Hop. If your blog is more than 2 months and less than 3 years old, and you're interested in getting some tech help, improving your blog, gaining like-minded friends and making long-lasting connections, then you might want to sign up for this worthwhile event. Go to my previous post for more details and the sign-up form. Alumni of former hops, please spread the word on your blogs! Readers, get ready to meet some new bloggers, and oh yeah, enter to win some pretty sweet prizes over the months of April and May when the hop runs a couple weeks during each of those months. 2. Come back tomorrow for the post outlining the details for this year's 30 Quilt Designs Challenge2018 that I'm hosting on Instagram, as well as a couple announcements on upcoming QALs. All right! Grab a comfy chair, maybe a hot drink or a glass of wine and visit some of the bloggers sharing their trips down memory lane. Quilt stories are the best! Bella loves it, and that is what matters the most. Fabric, today I went to a quilt fabric shop about 1 hour north of us. All I needed was some blue batik. There was not a single batik of any colour there at all, but I did get some bargains from the $2 a piece, lots were in an old suitcase.A great way to display a quilt, I thought. There was also a Singer machine, no drawers at the sides of the cabinet, for sale NZ $120. I thought of you!!! Thanks Linda! Crazy that you had that same fabric...I believe mine is all gone, unless there are a few scraps in the Christmas scraps box...you never know! Hope you see this, as you are a no-reply blogger so I can't respond privately to you. Maybe include your email like this next time ephdra (at) gmail (dot) com so I can find you but you won't get spammed, or see the link below the comments section as to how to fix this! Thanks for reading my blog! Fun to look at the things we've made from years ago, ponder the fabric choices, and see how they were made! 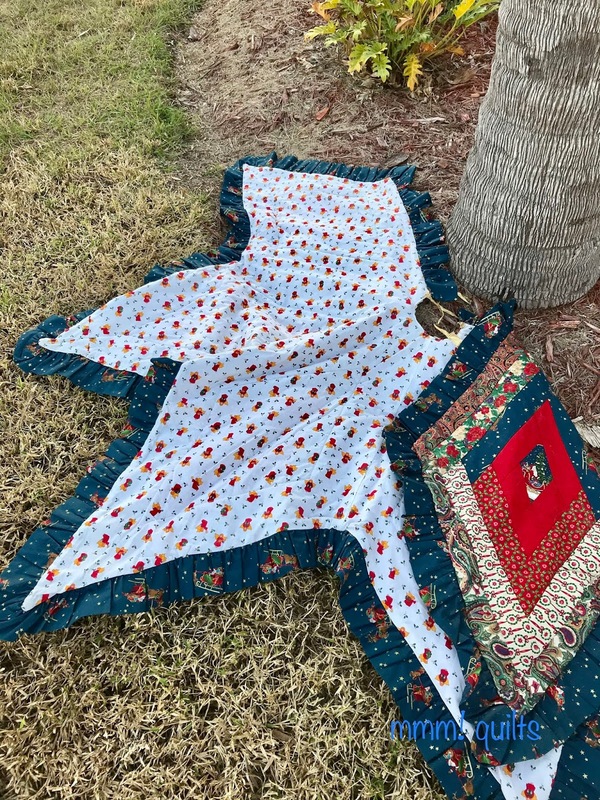 I love the Christmas fabrics you used for this tree skirt, and the great story you told about the making of it with your friend! I love those Santas! Isn't it fun to see and use the oldies. For prequilting, you sure picked an ambitious project! I love traditions, so I like that you’ve been using it year after year. And I think it’s great that you didn’t know the “rules” about value placement because I like how you divided the colors in the points. 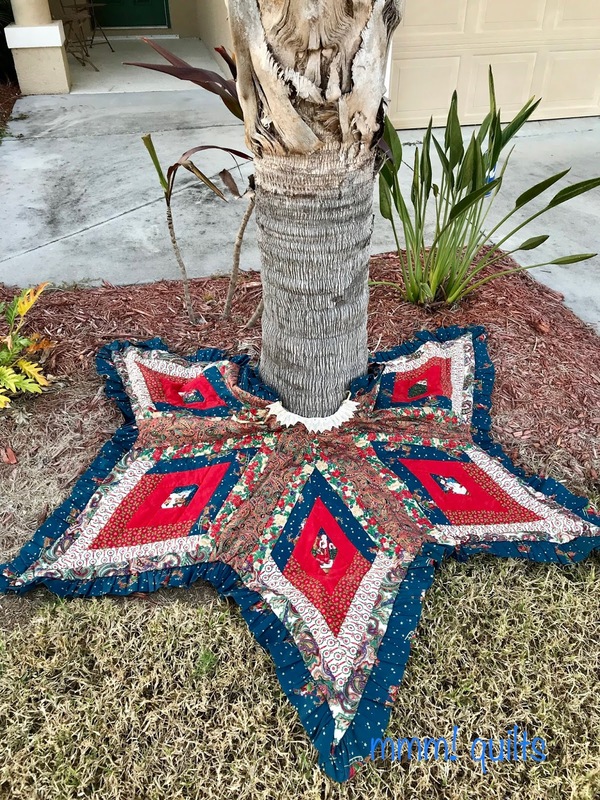 I love the story behind this tree skirt, I think that it turned out great! lame' and ruffles and foofy folderol, isn't it? I suspect Bella likes it because she is naturally foofy. Maybe it reminds of her of dear departed Grandmama! Old quilts tell the best stories. I love your tree skirt around the palm tree. What an interesting tree skirt and really interesting first pattern. Its funny - I heard someone in a store telling a customer something that was really wrong, but I just zipped my mouth. Sometimes teachers are not as prepared as they should be - I always try to have made something before I teach a class! I’ll get on this bandwagon one day and tell some stories too! Hi Sandra: I'll spread the news on my next post. I can think of a couple of people who might want to join in this year....and of course like always I'll be rooting along on the sidelines. an alien browsing the internet, to learn about our way of life, would wonder why trees in Florida wear skirts!